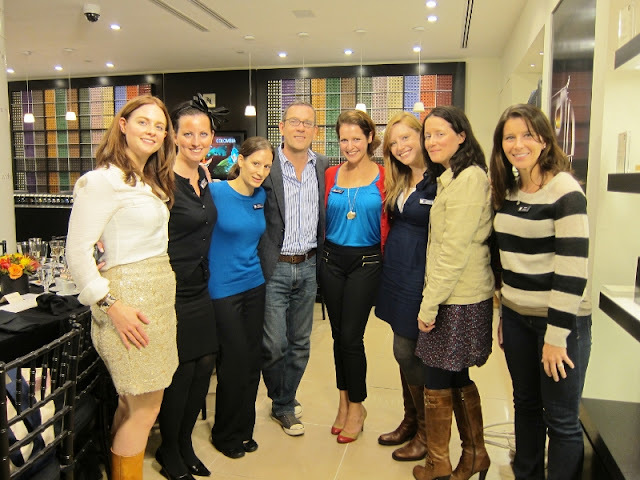 Last Wednesday night I had the incredible opportunity to attend a dinner at the Nespresso boutique on Newbury Street, hosted by Ted Allen (of Food Network fame) and Nespresso coffee expert Mark Uhlemann. Meghan and I met after work and ran into Bridget on our way into the event. When we got in, we were welcomed and shown around the shop. There were displays of Nespresso espresso machines and walls of coffee capsules, as well as a bar and dining table set up for the night's festivities. We learned about the different Nespresso machines, ranging from the Pixie to the new Latissima+. Before settling in at the table, we had time to mingle and browse the store. I love how the colorful coffee capsules are used to decorate the space. Over at the bar, we found some espresso-based drinks. We had a choice of an espresso martini or an espresso mojito. Even though it sounded like it could be really strange, I went with the mojito. The mixture of white rum, mint, lime juice, a hint of sugar, and an espresso floater was actually very tasty -- like black coffee with a little zing from the lime juice. Coffee-inspired appetizers were passed around to complement our espresso drinks, including espresso-crusted pork tenderloin on a golden beet chip with smoked apple and pecan compote; seared lamb loin with pear-currant relish and espresso yogurt on a pita square; a corn-fried oyster served with stilton creme on a spoon; and spinach and golden raisin malfatti (sort of like gnocchi) with brown butter, sage, and pine nuts. The lamb was my favorite. After cocktails, appetizers, and mingling, we were ushered to the table to begin dinner. Ted and Mike chatted with us about the Nespresso brand and products. They played well off of each other, making jokes and adding sarcasm, to keep the informative parts of dinner light and upbeat. Having seen the machines at Williams-Sonoma before, I was vaguely familiar with Nespresso but really didn't know anything about the brand. That night I learned that Nespresso is just the thing for people who like to savor their coffee, who think of it as an experience, and who value taste. Nespresso offers 16 Grand Crus as well as limited edition seasonal flavors. The high-quality coffees offer the ultimate coffee experience that you don't find in a styrofoam cup. Meeting and dining with Ted Allen was not as nerve-wracking as I thought it would be (he was very easy to chat with and very down-to-earth), but having cameras rolling and flashing constantly definitely made me feel as though I needed to be perfectly poised at all times. Each course consisted of a wine and espresso pairing. For our first course of a sweet potato cup with parsnip puree whip and coffee caviar, we were instructed to sip the sparkling wine first, then try the amuse, and then finish with the espresso. The Livanto Grand Cru espresso had similar caramel notes to those in the sweet potato. The coffee caviar was the most intriguing part of the amuse-bouche. I couldn't believe how much coffee flavor the little pearls packed. Our entree, a sirloin club roast with a silky and rich veal demi ketchup, was paired with a glass of Merlot and the limited edition Dhjana espresso, which was my favorite espresso of the evening. It's full-bodied, velvety, and smooth, with a hint of fruit. 2011 Fall Limited Edition "Dhjana"
The dessert course easily beat out the other courses. A stunning trio of mini desserts was served alongside the Decaffeinato Intenso and a glass of port. Mike mentioned that there was really no way to go wrong with this pairing, and I have to agree. Coffee, chocolate, and port all work well together in my book. I was happy to be onto decaf espresso at this point, as we were all buzzing and giddy from the caffeine. A pot de cream with hazelnut crema was smooth and rich. And the vanilla affogato with homemade biscotti was sweet but balanced and my absolute favorite of all the dishes we had that night. Before heading out, we stopped to thank Ted and gathered for a group picture. Oh, and Nespresso sent us all home with some very generous gifts: our very own Latissima+ Nespresso machines! I can't wait to try mine out. And that reminds me... I was recently visited by the Fairy Hobmother after I left a comment on Megan's Cookin'. The Fairy Hobmother is actually Ian from Appliances Online, which is currently promoting the Bosch Logixx line of appliances. The Fairy Hobmother sent me a $30 Amazon.com gift card just for leaving a comment on Megan's post. I am hoping to use the gift card to buy some little espresso cups to go with my new Nespresso Latissima+! You could also get a visit from the Fairy Hobmother just for leaving a comment on my post. Good luck! Have you ever heard of Nespresso?